A desktop photocopier provides the perfect solution for businesses that don’t have a lot of space, or don’t do a huge amount of printing day, to day. These photocopiers do what they say on the tin – they are small enough to sit on a desktop and come with a whole host of additional features in one small box. Desktop photocopiers tend to be A4 only devices, as the mechanisms required to pass A3 paper through the photocopier would make the device too large and heavy to sit on a desk. Desktop photocopiers can be incredibly basic, or multifunctional with advanced features. 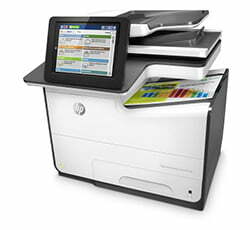 The latest desktop copiers are multifunction and can work as a scanner, printer and photocopier all in one device. Some even have the option to fax, if your business still requires fax functionality. These devices tend to be much cheaper than larger floor standing office photocopiers. Desktop photocopiers offer the same functionality as some of the larger photocopiers and some of the newer machines actually offer higher print speeds than a lot of floor standing devices. The HP PageWide 586dn prints at up to 70ppm, which by most standards would place it at a digital press print speed specification. If you find that you need more paper capacity out of your desktop photocopier, many devices allow you to add additional paper trays, making them a floor-standing office photocopier device rather than desktop devices. These additional paper trays can be added at a later date, so if your business only needs a desktop photocopier to begin with, but finds that demands increase, you can add additional trays to help meet new needs. This would then be situated on a cabinet to raise the machine up to an adequate height to be operated effectively. 1. The amount of work the photocopier is going to do – if you are printing off lots of documents, then it might be that you need a floor standing photocopier rather than a desktop device, as they are more robust. 2. How fast do you want the photocopier to print? 3. Do you need it to print in colour, or will black and white suffice? 4. How portable is the device? Can it be moved if required by a different team? Like all photocopiers, desktop photocopiers can be financed on a lease agreement, removing the need to purchase the device outright. The vast majority of Midshire customers finance their photocopiers via a lease, as it is the most flexible and tax effective method of purchasing, as you spread the cost over 3-5 years, rather than being faced with the upfront cost at the point of purchase. It also makes it easier to upgrade equipment at a later date. Many businesses go to high street technology shops to purchase their desktop photocopiers as they appear to be incredibly cheap, however the total cost of ownership can actually be much higher, as toner cartridges are incredibly expensive (widely reported as expensive as gold and even champagne). Emergency engineer repairs can also be very costly if the device is not placed on a service contact. Midshire puts all desktop photocopiers onto our Managed Print Service, which drastically reduces the total cost of ownership. You may spend more on the device, but the savings made on toner and service alone, more than make up for the initial investment whilst providing you with a friendly, efficient service that supports your business goals.